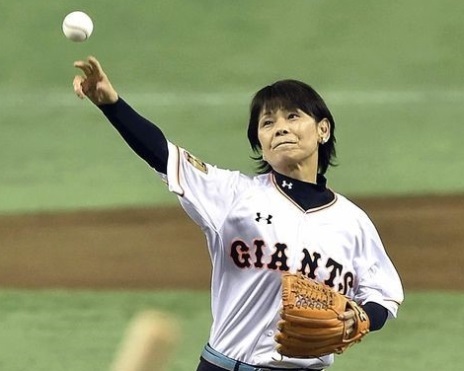 TOKYO – Opening day of Japan’s top sports league, Nippon Professional Baseball (NPB), officially opened its 81st season with softball hero Taeko Utsugi, who coached the 2004 Japanese Olympic Softball Team, throwing out the 2015 ceremonial first pitch at the Tokyo Dome. In strengthened collaborations between NPB, under second-year Commissioner Katsuhiko Kumazaki, and Japan’s baseball and softball governing bodies (Baseball Federation of Japan and Japan Softball Association), Japanese baseball and softball leaders are focused on raising awareness within nation of the opportunity for baseball and softball to regain their Olympic status at the 2020 Olympic Games in Tokyo. NPB’s 2015 slogan for this season is “The future rides on this one pitch,” which calls on the importance of baseball/softball to earn a spot in the 2020 Games. BFJ, NPB and JSA are all members of the WBSC and are carrying out national campaign efforts in partnership with the world governing body, under President Riccardo Fraccari. Utsugi is also a member of the WBSC executive board. With the IOC having opened the door for host cities to propose additional sport-events, baseball and softball, as well as other sports, are hoping to be among the new events proposed by Tokyo 2020 organizers to be on the official 2020 Olympic sports program. The IOC has set a mid-September deadline for Tokyo 2020 organisers to submit their proposal for what, if any, additional events they would like added. Various media reports have signaled that baseball and softball are the “favourites” to be added to the Tokyo 2020 Olympic Games due to their immense popularity in Japan. In a national poll conducted by Yomiuri earlier this year, the survey found that nearly 70% of respondents would choose to add Baseball/Softball to the 2020 Tokyo Olympic Games, with other sports polling in the single digits. Both Japan’s National Baseball Team and National Softball Team are currently ranked No. 1 in the world. In 2014, NPB’s attendance was approximately 23 million—the 2nd highest annual attendance of any sports league in the world – and up 3.4 percent from 2013, with an expanding women fan-base helping drive the increase. BFJ, NPB and JSA recently collaborated on the production of a video featuring some of Japan’s biggest names in sports, television, music – as well as a JAXA astronaut – in support of making baseball and softball Olympic “again”. The video has since been viewed over 315,000 times on YouTube. In a further boost, it was announced in January that NPB would be a co-host of WBSC’s Premier12 pro national team championship, staging an opener in Japan – and the semifinals and finals at the Tokyo Dome. In 2013, WBSC’s last bid to include baseball and softball in the 2020 Olympic Games finished second, only behind wrestling. The IOC will make a final decision on the 2020 Olympic sports program next year ahead of the Rio 2016 Olympics.